Low profile, easy to move, pallet-weighing scale. 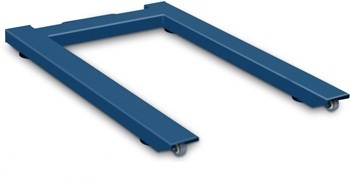 Suitable for industrial and commercial applications, in which it’s necessary to quickly weigh goods on a pallet. The standard version is provided with approved load cells. Functioning with 4 shear-beam 350Ohm nickel-plated steel load cells, approved according to OIML R60 C3 standards (3000 divisions), IP67 protection degree. Accuracy: +/- 0.1% of the maximum capacity in the versions for internal use. Accuracy: +/- 0.05% of the maximum capacity in the "M" approved versions. Moulded sheet-steel structure, oven-fire painted RAL 5007 blue. Adjustable, shock-proof jointed feet, level, 2 wheels and handles for moving it. Shielded about 3m long cable for connection to the indicator. - support column for indicator. KWR10 Kit of 4 rubber wheels and galvanized steel frame for CSP column. A pair of idler wheels and a pair with brakes. CT6 ISO 17025 calibration certificate from 301 to 1500 kg. For precision and industrial scales, crane scales. CT7 ISO 17025 calibration certificate from 1501 to 3000 kg. For precision and industrial scales, crane scales.